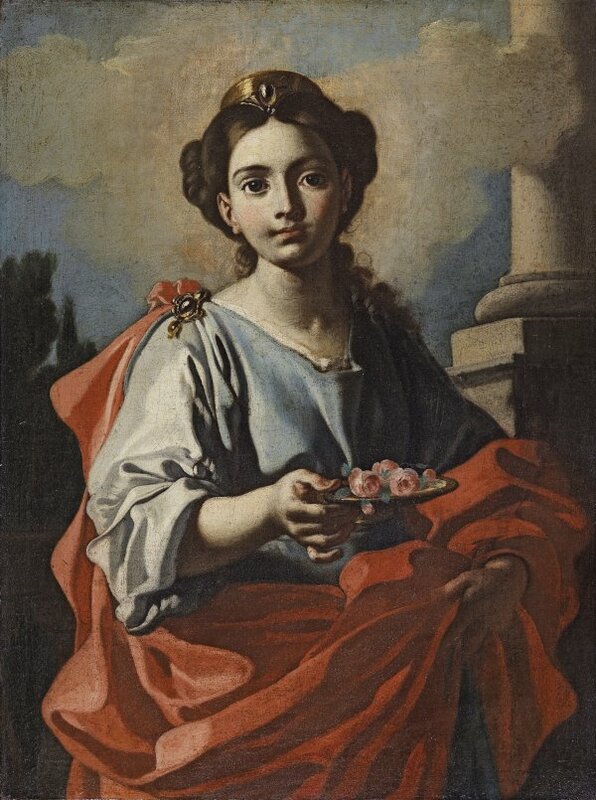 The young saint, represented in a full-fronted three quarter figure, on a background tinted with a Mediterranean flavour, with a sky with heavy yellowish clouds, and framed by a column and some cypresses, frees herself from a generic anonymity thanks to the attribute of the plate with roses she holds in her right hand, almost offering it to the observer. This object can be related to at least two characters: the saint and martyr Dorothy of Cappadocia (although in that case she should be carrying some apples as well as the roses) and, if we ignore the discrepancy of the richness of her dress, with jewels adorning the hair and shoulders of the model, the hermit Rosalia, usually represented with Jesus as a child offering her a crown of roses. In any case, as the restorers Ubaldo Sedano and Juan Alberto Soler Miret have made evident, the present iconographic representation is the result of a modification during the execution, since the painting shows some corrections, which may mean that the original subject was rather different. Still visible to the naked eye under a side-light is the presence, in her left hand, of the palm of martyrdom, painted over by the red cloak and the shaded foot of the column. It therefore seems justifiable to suppose that originally the plate held the characteristic attribute of St. Lucy, that is her eyes, which she presents on a tray. The need to suppress such macabre symbols may have induced the artist to transform at a later stage the eyes into the small roses which we can see today. Clearly impregnated with the style of the last years of Francesco Solimena, the main figure on the Neapolitan post-Giordano scene, that is between 1680 and approximately 1750 (how could we not recall the allegorical figure of Peace in the decoration of the Royal Palace of the Pardo in Madrid, with Hymen, Hercules and the Virtues of Marriage? ), this work has been attributed to one of the many disciples of this artist, Jacopo Cestaro, active in the central decades of the 18th century. 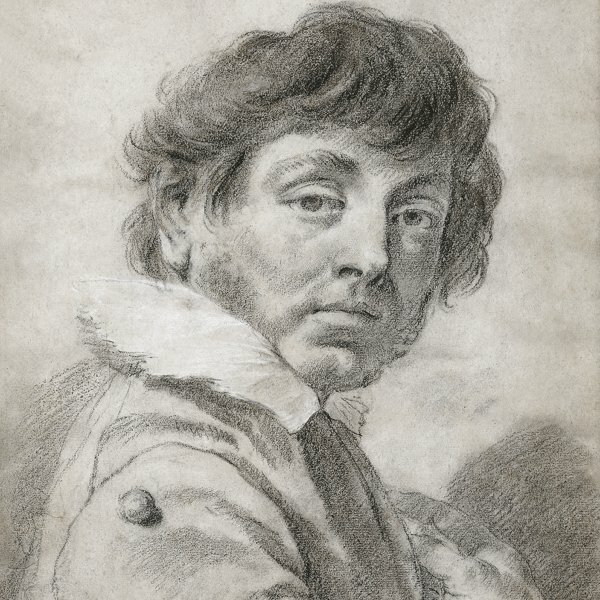 However, the present author is not entirely convinced of the possibility of Cestaro being among the polyphonic list of followers of Solimena, due in particular to the iconographic lack of expression, typical of a production in series, on the face of the young woman, which means that she cannot bear the comparison with the passionate heroines of the greatest works by Cestaro (Cleopatra, Rome, formerly in the Sestieri Collection; Cleopatra, Naples, Capodimonte), although it could be more directly related to the supposed production of the artist's youth, around 1735-1740, corresponding to the series of oils sent to the church of the Immaculate Conception in Fuscaldo. 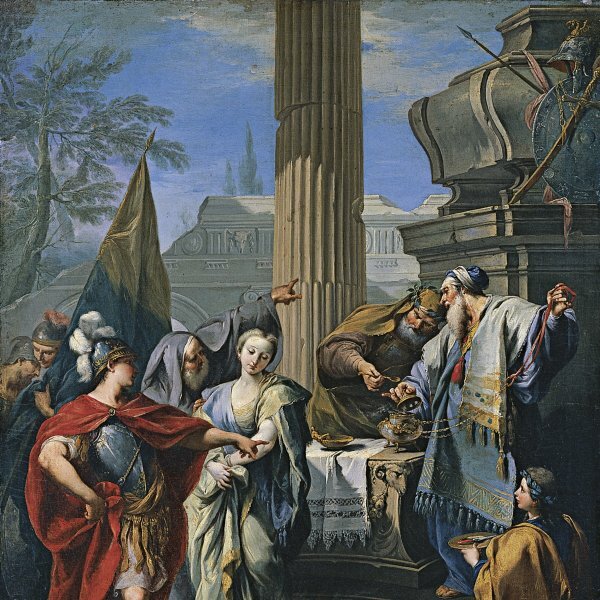 This atemporal childishness, which follows word for word the rules of a fully 18th-century Imperial Grammar, can be perceived also in other works by Cestaro (I am referring in particular to the masses represented on the foreground of the Presentation of the Virgin to the Temple and, in general, to the Circumcision, both of which belong to the Fuscaldo cycle, 1 but I am not sure to what extent these paintings may be equated to the Saint being analysed here. However, even if we consider valid the hypothesis of the paternity originally attributed to the work (and I do not wish to pursue an alternative affirmation), we should bear in mind, among the army of followers of Solimena, at least the names of Lorenzo de Caro and of Giuseppe Bonito. In the Saint Peter of Alcantara Confessing Saint Teresa (Naples, church of Santi Filippo e Giacomo) by the former, the face of the saint, although his skin is more shivering and wasted away than others, offers at least a paradigm of inexpressive roundness not exempt of formal affinities-in any case, it is a "natural" complexion as opposed to a mere oleograph-with the refined face of the saint studied here. Much more convincing is the stylistic coincidence shown by a number of elements in the work of Giuseppe Bonito; it is the case of the florid peasant posing for the Allegory of Autumn in the Santangelo Collection in Naples, whose stare has a stereotypical fixity, almost identical to that of our Martyr, whose tight lips make an allusion to the different ways of giving or of giving oneself.